Perfect for bicycle paths, forest preserves, schools or any outdoor area—ready to provide a little information. Constructed of commercial quality, eco-friendly, maintenance-free recycled plastic with stainless steel hardware adding strength and durability for years to come. One piece stainless steel hinge runs the full length of side of door. All hinge fasteners are internal eliminating chance of screws being removed by would be vandals. Secured with keyed barrel lock that is weather resistant and all-season ready. The polycarbonate window provides protection and better than acrylic for both scratch and shatter resistance. 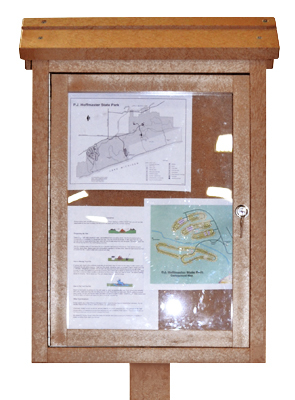 These message centers are available in single and double sided with post designed for in-ground applications or for surface mounted using the optional anchor kit, the single sided no post can be installed as a wall mount.